Welcome to the online home of award-winning Author, Theological Investigator, Lecturer and Dr. Hypnoanalyst, Dame Ysatis De Saint-Simone. Dr. De Saint-Simone has developed a collection of amazingly powerful diagnostic and therapeutic but extraordinarily simple and powerful tools that instantaneously open lines of Mind-cell communication, enabling people to implement at the deepest levels the willed changes they desire. 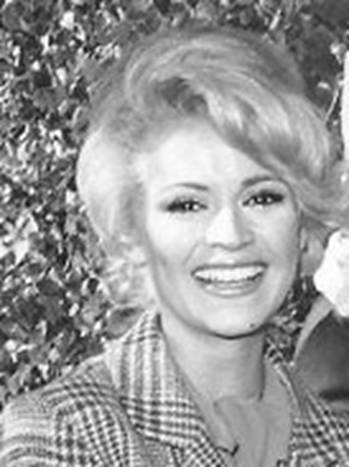 Best known for her pioneering practice in the field of mental healing, Dr. De Saint-Simone’s visionary approach coupled with a rigorous adherence to the highest scientific/spiritual standards has won her the Silver Medal of the University of Alcala de Henares in Madrid, Spain and her accomplishments in the fields of Personal Transformation and Healing through the Mind international acclaim with the title of Dame of the Sovereign Order of Saint John of Jerusalem. Click here for more information about the about the Sovereign Order of Saint John of Jerusalem. I Know from personal experience’, says Ysatis, ‘that Know Thyself, the axiom of Wisdom inscribed on the great shrine of Delphi dedicated to Apollo in ancient Greece, is not only wise advice, but Essential for all humans who desire to have Peace of Mind and Become the magnificent Unlimited Beings that we are created to Be - knowing, powerful, exuding Peace, health, joy, beauty and in command of our lives. The History of Stress - How did Stress begin? The Method I use to Remove Stress is a Scientific Method called Hypno Analysis, a process of natural deep and direct introspection into your subconscious mind. Click here to continue reading. Now Quantum Science sees the Universe as 'A Web of Living Mind' an Ocean of Information, one of unlimited options and potentials, limited only by the mind of 'the observer'; those limitations are in turn determined by 'the observer's' conditioning or program. Click here to continue reading. As I said before, this view of life is not new. It is the deepest, most profound and most ancient teaching of wisdom, going all the way back to the ancient Sumerian and Egyptian civilizations, which were known and highly respected by the small group of us who work with the mind and in the spiritual field. This ancient Teaching of Wisdom has just become scientific by Quantum mechanics supporting its most essential teachings with its latest findings. This ancient teaching taught a dynamic attitude of eternal vigilance of the mind's thoughts, fears and inclinations from a center of self-introspection - the View of the Ultimate Observer - to prevent any force from having greater power in designing our lives than our own willed choice, putting then the responsibility of our life in our own hands. Click here to continue reading. We have seen how this truth our Quantum scientists have just discovered is not new, but ancient, as ancient as our origins and a fundamental teaching in ancient Persia and Egypt. From the remote ages of antiquity this remarkable teaching existed, which is universal in its application and ageless in its wisdom, it has no boundaries or limitations of age, epoch creed or race - if you have a mind, you can unlimit it and live up to the fullest potentials you will IT to develop.Click here to continue reading. Ultimately, in talking about stress it’s good to find out its nature and purpose. What is stress? Stress is energy, not only a natural feature in our bodies and part of our daily experience in life, but it is also inevitable for it is linked to our evolution. And an unavoidable side effect of the urge to express our purpose. Stress is that energy in us that produces definite points of tension paving the way for growth, each center of energy in our bodies has been the target of stress; as I said before; we can observe this process in the enfoldment of the petals of a flower and the enfoldment of wings of the butterflies. Click here to continue reading. AWAKEN THE POWER WITHIN YOU AND LIVE! 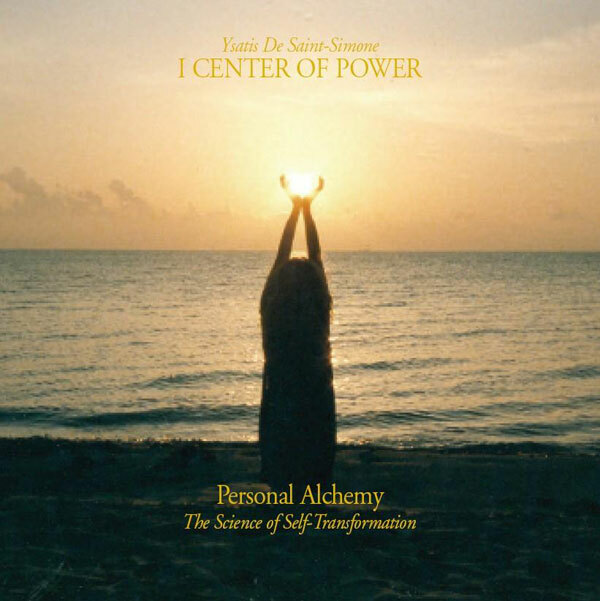 No transformation is impossible for the person who uses well the amazing method of Personal Alchemy and by listening to the I Center of Power CD. Everyone is able to almost instantly master the energies that handled them in the past when the power within them is drawn into their conscious mind and they start acting from a center of choice and power, releasing, transforming and utilizing energies that handled them before, to instead create their own reality for their growth, well being and that of others. If you really want to change don't let anyone tell you how good the Personal Alchemy Method is and what it can do for you, experience for yourself the most awesome Transformation. You will love the change. When practiced everyday as taught, this ancient, and modern state of the art technique of meditation becomes alive and real in you, opening up new options for self-expression in your life. 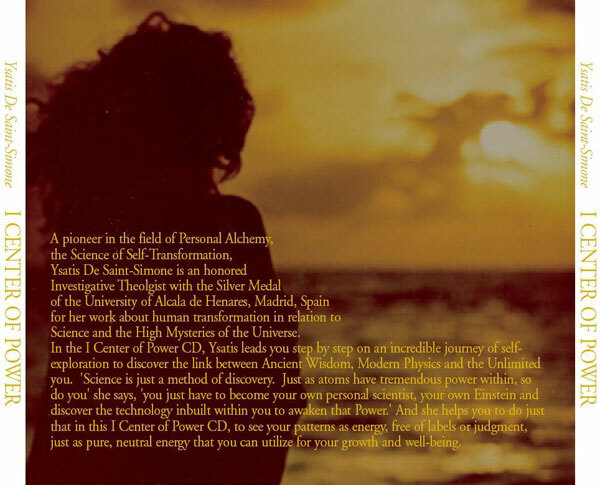 Follow her directions in the CD and unveil a new dimension of yourself and the power latent within. The Transformation of your limited ego into its Unlimited Self will indeed free you from stress and unlock incredible potentials which will allow anyone to create the life they envision for themselves.